The Shape Japer is female and often the cause of things changing shape, or particular shapes having problems. She flies though the air, doesn’t speak much, but laughs a lot. She is able to change her shape from sphere to cube at will. Slightly mad and instinctive rather than calculating. The Puzzler is male and the usual cause of things being in the wrong position. He’s a an ex-DJ, speaks in rhyme and loves setting puzzles. He’s a floating circular face, with features that can move around. 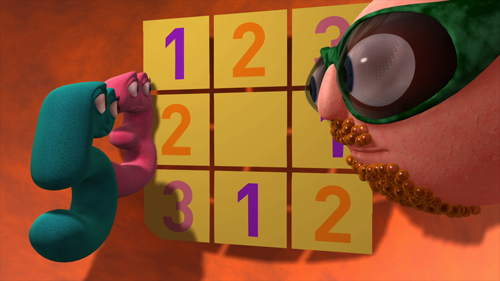 He’s quite intellectual, and is secretly pleased when the Numberjacks solve his puzzles. He sometimes bubbles as he speaks, and can blow giant bubbles to trap the Numberjacks inside. The Numbertaker is male and silent. He causes trouble by taking numbers and “numbers of things”. The sleeves of his long with coat hide various attachments – a vacuum-cleaner, a net, a hook, a “picker-upper”. There’s something of a (rather sinister) street performer about him. He sometimes becomes his alter ego and is the Numbermaker, causing problems by creating numbers and numbers of things. Spooky Spoon is female, and loves to stir things up and mix them – she’s usually the source of problems with matching and connecting. She really fancies herself, thinks herself superior to everyone around. Very vocal, has a particular dislike for 5, who she feels is something of a rival.